"13 glorius years old. Unlucky for some? We think not! ", that's what it says on the label. I love quirky little details like that, and independent bottler Douglas Laing seem to take pride in adding these fun little details from time to time. Keep it up, I say. So, what we have here today is a Caol Ila 2000 13 YO Old Particular. Matured in refill hogshead #10340. It was distilled in December 2000, and filled into 141 bottles in May 2014. It is strange how fast time passes by, it's like someone hit the Fast Forward button. Maybe I'm getting old, I don't know. There is still a lot of whisky to try though. This bottling appears to be sold out already, which I guess is no big surprise given the low number of bottles. It might suddenly surface somewhere though, so keep an eye out. It sold for about GBP 68, which is quite reasonable in this day and age, as I see it. Nose (22/25): Sweet smoke and citrus (lemons? ); this is a Caol Ila alright. No monkey business, this is the real stuff. Lots of dry and sweet ashes. Nice malty feel, not a very active cask. Taste (23/25): Chewy, grainy, peaty. Sweet, almost sugary, with citrus notes now tending towards oranges. Finish (22/25): Here comes the ashes and lingering smoke, but at the same time it is quite fresh - the citrus notes should take the credit for that. It has a long and warm finish. A bit salty towards the end, and a bit tingly - it makes a little happy dance on my taste buds. Balance (22/25): Well, this was certainly not an unlucky bottling for Douglas Laing. 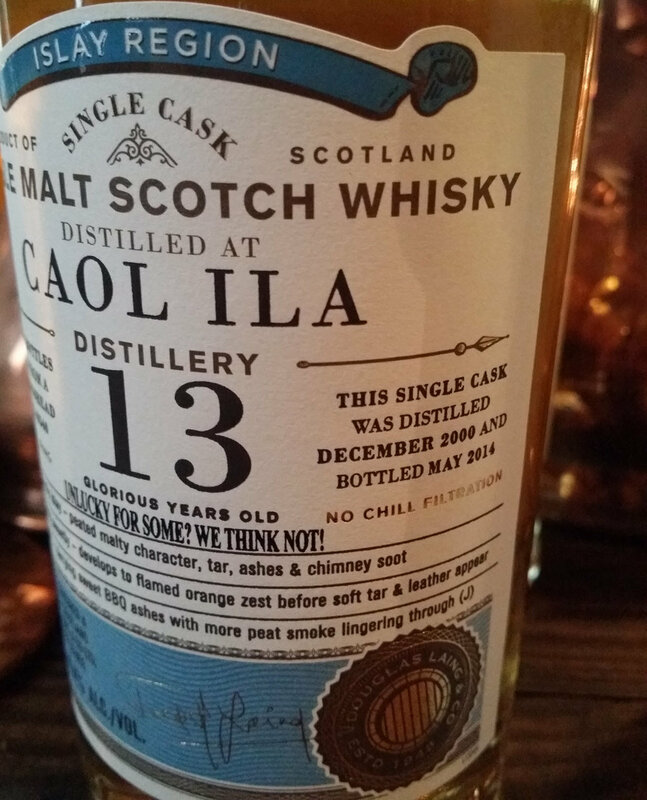 Thirteen appears to be a fine age for this Caol Ila.